The internationally acclaimed taiko ensemble TAO returns to the Fox Tucson Theatre on Tues., April 24 at 6:30pm with their new show Drum Heart. 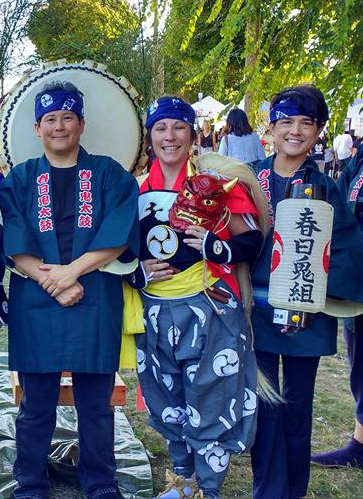 Through a unique partnership with the Fox, we’re able to offer Odaiko Sonora fans and friends (that’s you!) discounted tickets ($25 instead of $37). »Contact us for details. Karen and Nicole with Tamaribuchi sensei on their annual pilgrimage to Sado Island in 2016. Our next All Ages Recreational Taiko (AART) session is 5 weeks long, starting April 21 and running through May 20, 2018. You’ll learn rudiments of taiko, a song from Odaiko Sonora’s repertoire, and drills to hone your new skills. »More info. Also in April, Karen and Nicole made their annual pilgrimage to Sado Island to participate in the Kasuga Ondeko Matsuri. Read more about this on the Odaiko Sonora Facebook page. Nicole also created this YouTube video that gives you a taste of this year’s adventure.